Expansive and peaceful. 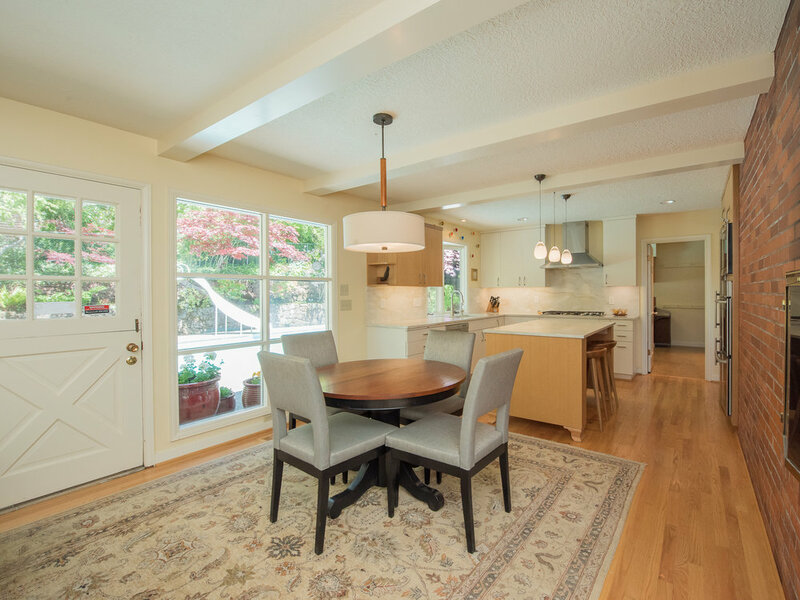 Enjoy the zen vibe of this mid-century oasis nestled at the base of Rocky Butte. 5 bed · 3 bath · 3418 sq. ft. This Mid-Century Modern beauty sits nestled at the base of Rocky Butte on .34 acres, surrounded by established Japanese inspired landscaping on a quiet-dead end street. It's an idyllic site - boasting 3 fireplaces, 4 bedrooms/3 baths and a non-conforming 5th bedroom downstairs, remodeled gourmet kitchen, restored old growth hardwood floors, expansive windows and central AC. It has a 2-car garage and tool/workroom, saltwater pool and zen garden. 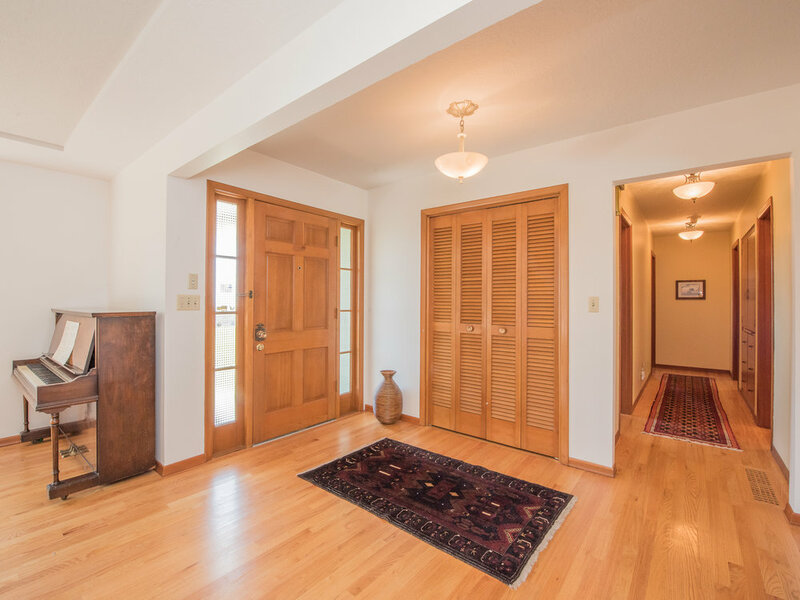 Original mahogany trim and solid fir doors throughout offers a warm organic touch that compliments designer colors on the main floor. Simplicity echoes in the living room where the focal point is the original brick fireplace, centered in the heart of the home. Thoughtful design harmonizes with the outdoor views, patio, Japanese-inspired landscape and surrounding forest. 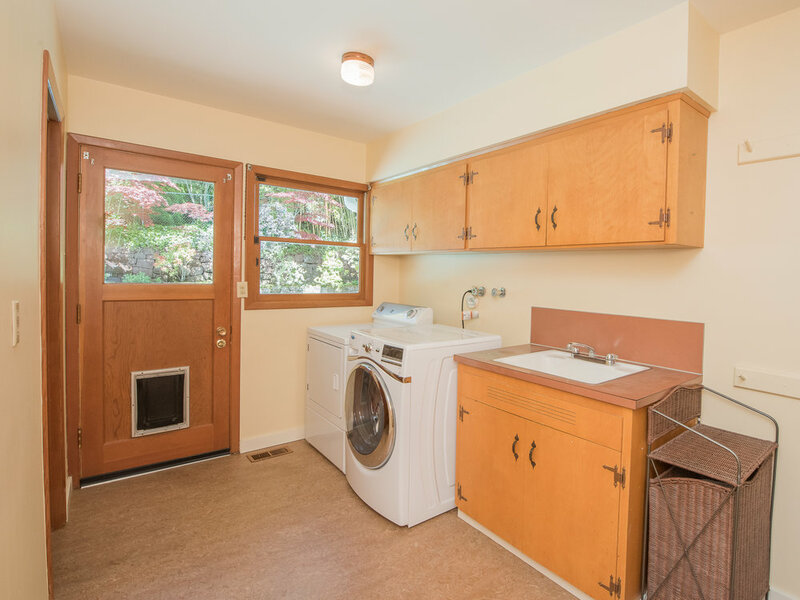 Very centrally located, just 15 minutes to downtown Portland. 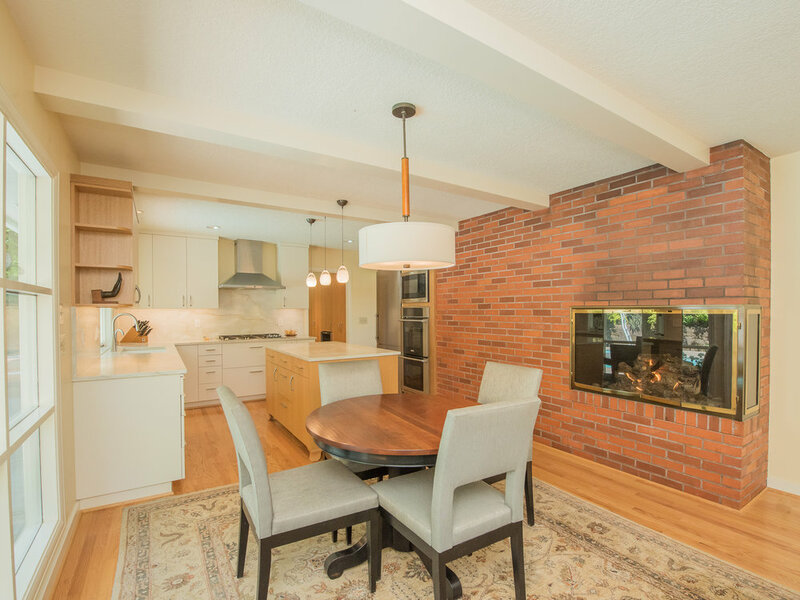 A gracious and sprawling floor plan is centered around the brick mid-century floor to ceiling fireplace - the heart of the home. Upon being welcomed into the home, the open floor plan thoughtfully designates a change in space by a lowered ceiling over the entry, transitioning to a higher tray ceiling in the large living room with floor to ceiling stone fireplace. 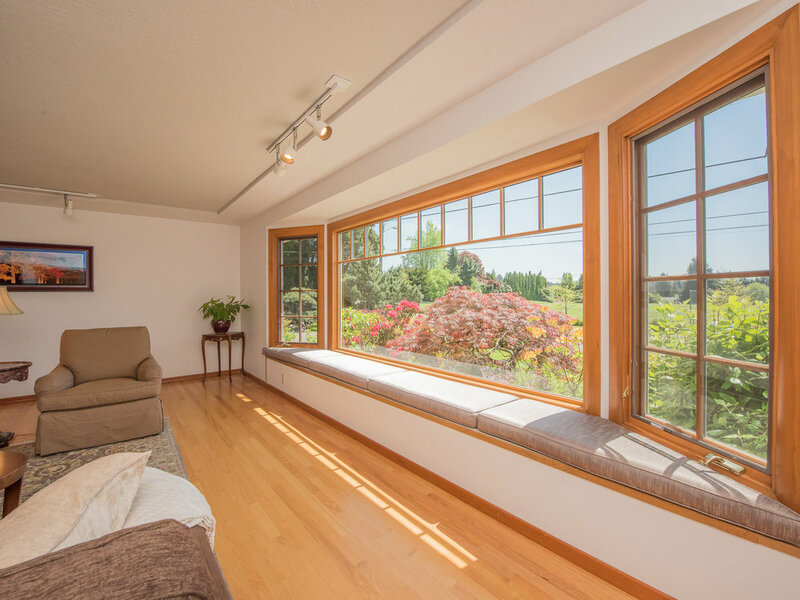 An expansive picture window floods the room with an abundance of natural light. A passage way on either side of the fireplace leads into the connected areas of den, dining and kitchen. The den features a custom built in and second fireplace, a corner unit converted for gas. The dining has a door to the backyard and floor to ceiling windows with views to the lush outdoors. The updated gourmet chef's kitchen overlooks both the backyard and dining area, while remaining close to the custom pantry. It is both functional and beautiful. The high-quality materials of white oak and Carrera marble will outlast the trends of design and compliment the modern lines of the home. A masterpiece of good design. This 5 bedroom and 3 bath home features a well-designed layout. 3 bedrooms and one bath are all easily accessed by a long hallway, keeping the more private and quiet spaces isolated from the common areas. This thoughtful layout aids in the peaceful and tranquil feeling in the home. The updated bathroom features natural stone and designer plumbing fixtures. The custom double sink/vanity is made from a reclaimed sideboard. An original built-in located in the hallway allows for convenient linen storage, as well as a pull-out folding station. Offering even more privacy, the 4th bedroom is located at the opposite end of the home. Ideally used as a guest room, it could also function as a home office. Each bedroom has calming outdoor views further adding to the feeling of an oasis in the city. 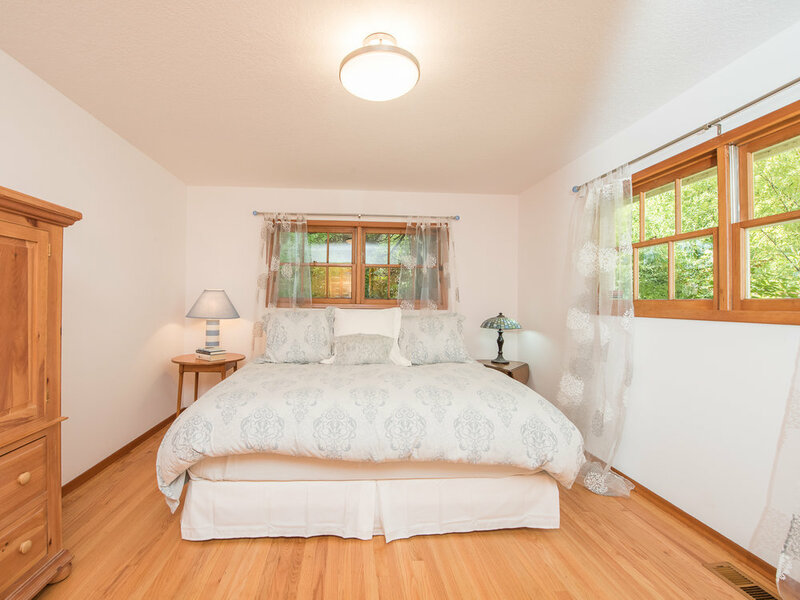 All bedrooms feature original closets with mid-century influenced built-ins. The 2nd bathroom, on the main floor, is conveniently located near the guest room, just off of the mudroom with access to the backyard. It functions as the perfect place to rinse off after a refreshing swim or soak. 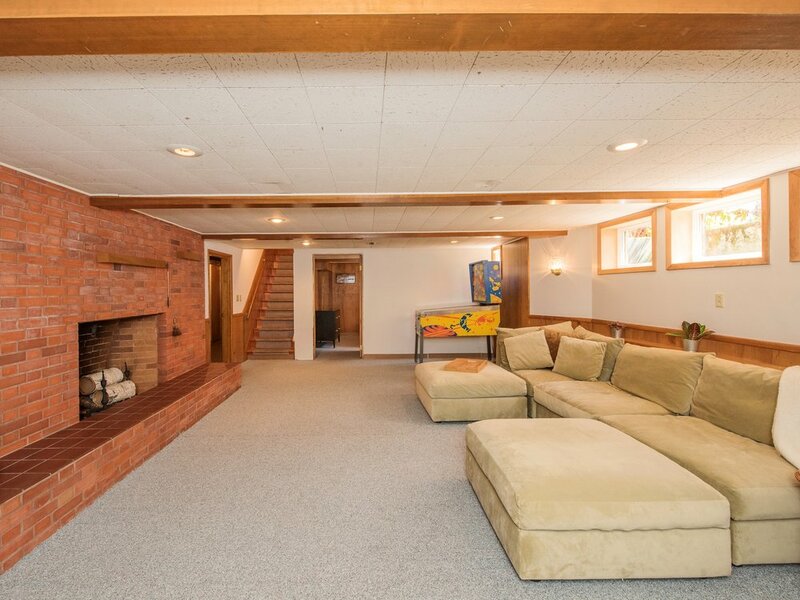 The 3rd fireplace is located in the large family room in the basement. The wood burning fireplace it is a masterpiece of mid-century design with integrated stone ledges and hearth. Potential abounds in the rest of the basement. The basement could function as a secondary living space with a non-conforming 5th bedroom, the 3rd bathroom, kitchenette and plenty of storage areas. The mud porch and laundry, seated on the main level, offer convenient access to the backyard and the attached garage. The large 2-car garage offers ample areas for storage - including drop-down attic storage with electricity for lighting, as well as an attached tool room complete with work bench. Over 30 years of hard work, research and dedication has been put into the grounds to achieve the coveted low maintenance "mow and blow" status. Northwest natives paired with carefully selected Japanese flora surround the home and grounds. Additional Japanese influences are evident in the zen rock garden with petrified wood boulders, the beds edged with reclaimed handmade imported roofing tiles from the Portland Japanese Gardens, and the outdoor patio with columns designed after a traditional Kyoto garden. Privacy is afforded by the tall leafy bamboo atop the dry-stacked lava rock wall running the perimeter of the fenced in backyard. The backyard is also home to a saltwater pool, with removable safety fence and a hot tub for relaxation among the serene environment. Entertaining is a delight as well with many areas for socializing, dining, or sitting with a good book. A home focusing on quality of life. 9335 NE Thompson is a well balanced home. Loving stewards of the house, the present owners have spent 30+ years adding their touch of interior improvements and Japanese influence in the landscaping. Here, simplicity is the style. The thoughtfully chosen materials and their use create a sense of calm and warmth – ultimately providing peace within. Consulting with specialists and master gardeners at the Portland Japanese Gardens, the homeowners carefully selected unique plantings to add to the zen vibe of the property. A variety of Maple Trees include: Red Dragon, Coral Bark, Emperor, Lion’s Head, Orange Dream and Blood Good. Speciality evergreens include Mugo pines, Chief Joseph pines, Nest spruces and 2 Bonzai Pines estimated to be over 80 years old. Remodeled by highly regarded local woodworker, Goetz Woodworking, the kitchen was designed with functionality in mind. High end appliacnes making preparing a meal enjoyable. Dacor gas cooktop, Electrolux wall oven, Bosch dishwasher and integrated Liebherr refrigerator. With such a tranquil setting surrounding the home, one can often forget that they have the joys of Portland city living so close at hand. From hiking trails and city parks, to limitless options for ethnic eating and easy access to downtown and travel corridors, the home's location is ideal. Nowhere else in the city can one get better panoramic views. East is Mt. Hood, North are views of Mt. St. Helens and Mt. Rainier. At the top is Joseph Wood Hill Park - a beautiful & historic spot. Cliff faces on the NE side of the butte hold over 100 climbing routes and bouldering practice can be enjoyed on the stone walls at the summit. Built in 1923, it is the second oldest municipal course in the city and state. Located in the center of northeast Portland neighborhoods the it is a classic, tree lined course that is both playable and challenging for players at all levels. The Grotto is an internationally-renowned Catholic shrine and botanical garden located minutes from downtown Portland, serving over 300,000 visitors annually. A relatively small neighborhood buffeted to the east by Mt. Tabor and embracing 82nd Avenue (the Avenue of the Roses), Montavilla manages to offer up just about anything you can find elsewhere in Portland. Its commercial strip along SE Stark is a concentrated jolt of bars, coffee shops and entertainment, and its residential blocks are marked with charming craftsman houses and tree-lined streets.